By the way, there are no spoilers stated in this. I had heard mixed and even disappointed reactions about this movie before I saw it. I had also heard that something somewhat shocking was in it, and I kept getting the vibe that it broke canon. For those unfamiliar with that term, "canon" refers basically to the "bible" of the universe/franchise. For example, if we had a movie where Voldemort actually loved someone, it would break canon, because it has been established that Voldemort is actually literally incapable of love. It goes against rules and boundaries already established. So I didn't go in with super high expectations. Mind you, I didn't go in with super high expectations for the last one (though I loved it), simply because this series will never be Harry Potter, and they are prequels, and if you've read the books, you already know how the story ends. That's not to say that I didn't go in with tons of excitement. Because I did. Any chance to get more from the Wizarding World is always a mega plus to my muggle mortal existence. But because of what I'd heard, I kept waiting for something really awful to happen. I kept waiting for really bad writing or a ridiculous rule change that ruined what had come before. Like I mean really ridiculous. If you don't believe me, here are some things that were passing thoughts: Did Dumbledore and Grindelwald somehow magically have a kid? Will someone be brought back from the dead (which would be a huge no-no and would really break canon)? Did Dumbledore make a Horcrux? Is there a fourth Deathly Hallow? Rest assured that there was nothing as crazy as that! In fact, I really enjoyed the movie. The characterization was on point, and their dialogue exchanges great. One of the insignificant questions I ask myself about characterization, is "Would it be interesting to watch these characters go grocery shopping?" I know that sounds weird, but here's the thing. Grocery shopping is so mundane. So if it would be entertaining to watch that character or characters do that, then they are intriguing enough to watch do anything else. I think our four main characters for Fantastic Beasts meet that. In fact, their characterizations and interactions are one of the best parts of the show, in my opinion. And their acting was great, even all the way to the young actors who played Newt and Leta as Hogwarts students. Man, the one who played Newt--I seriously don't think you could have asked for anyone better. In fact, I found myself wondering how they all got it so right. Jude Law's interpretation of a younger Dumbledore? Dang, I could watch that guy all day. I loved it. Jacob trying to give advice about girls to Newt? (And then watching Newt try to act on it?) Absolutely adorable! I could see how some people might be upset with Queenie's ultimate direction, but I actually really thought the opening worked well. We got to see another (contrasting) side to her that made what could have become a flat innocent character more complex. (As I've said before, whenever you want to make a character more complex, give them something contrasting or contradictory--the complexity comes from reconciling that within their characterization.) And then there is Grindelwald. When I saw the last Fantastic Beasts movie, everyone laughed when they saw Johnny Depp. Everyone. Ten minutes into this film, and no one was laughing. In fact, I found myself thinking, "Hedwig, we aren't at Hogwarts anymore!" I mean, we all know Voldemort is really a bad guy, right? But for the majority of the Harry Potter series we don't actually, as an audience, see him being that bad. After all, the epitome of his rule happened prior to the books. It was pretty chilling to see a dark wizard actually do really terrible things--dang there were some really great ways they conveyed that in the opening. The opening was great. The characters and relationships were great. The acting was great. The world was great--I mean, a wizarding circus? Hogwarts in the early 1900s? (With a boggart and the Mirror of Erised?) The Wizarding World in Paris? A glimpse of the Sorcerer's Stone? More fantastic creatures on screen? Baby nifflers?!?! I'm eating it all up. 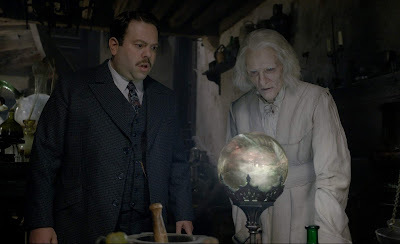 I'm eating up Newt and Tina, Newt and Jacob, Jacob and Queenie, seeing Dumbledore having to deal with the ministry thinking he wants to be minister even clear back then (something alluded to in the books). Seeing Dumbledore cleverly manipulate the pure in heart to do his work, again. Seeing Dumbledore in front of the Mirror of Erised, knowing all the way from book one that he had lied to Harry about what he saw in it. Is this like a dream come true? I'm salivating. Then there is the plot. Do you remember when after Harry Potter, every other major film series decided they wanted to split their movies into "Part 1" and "Part 2"? (When their story didn't actually need it?) This movie felt like a "Part 1," where the end is really more of a midpoint than an end point. Obviously there are more films in the series, so yeah, I guess that makes sense. But every other Wizarding World film (minus Deathly Hallows because that literally was split in two) can stand on its own plot-wise. This one? Not so much. It either felt like a Part 1, or it felt like one of those middle movies, where it's acting as a bridge to move from the first movie to the next movie. This might be the part where those who saw the movie go, no, no, it was the reveal! It was the reveal that didn't work for me! --Dude, hold on, I'm getting to that part. Just listen. As most of you reading this know, I'm a HUGE Harry Potter fan. For those that don't know, I did my capstone project on it in college, and I am a panelist every year at FanX (Salt Lake Comic Con) for the Wizarding World panels. One of my FAVORITE things about Harry Potter is that J.K. Rowling is a MASTER at what I call "undercurrents" in stories. To me, the undercurrent is all the plot stuff that's not on the surface of the story. Rowling is a master at undercurrent plotting, both in each volume of Harry Potter, and then in the series overall. I did a whole post about crafting undercurrents in stories, using Harry Potter and the Chamber of Secrets as an example. (You can read that here.) I personally believe that her ability to craft great undercurrents is one of the reasons the series was so huge. However, undercurrents are meant to be underneath a surface story. For example, in Goblet of Fire, the undercurrent story is about Barty Crouch Jr. and Peter Pettigrew giving Voldemort a new body and needing Harry's blood to do it. The surface story is that Harry has to compete in the Triwizard Tournament, and he doesn't know who put his name in the Goblet of Fire. Similar thing in Order of the Phoenix. The undercurrent story is about Voldemort needing the prophecy from the Department of Mysteries, but in the surface story, we are largely following Harry dealing with secondary antagonists--particularly Umbridge being at Hogwarts. In Deathly Hallows, the undercurrent story is about the Deathly Hallows, but the surface story is about Horcruxes (which interestingly was the undercurrent story of the Half-blood Prince). In every Wizarding World installment up to this point, we have had surface stories being paired with undercurrents. 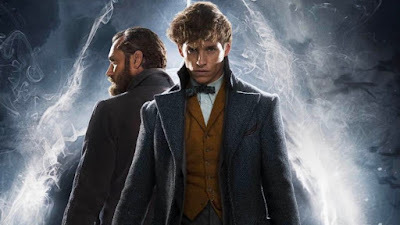 Crimes of Grindelwald is the first one that doesn't really do that, which actually automatically causes a few potential problems. Crimes of Grindelwald is only really about the undercurrent. This makes things difficult, because the undercurrent is supposed to be under the surface story--but this installment doesn't really have a clear surface story. Because the undercurrent is the story, we innately can't feel the same degree of tension, because undercurrents don't fully reveal or explain themselves until the end, if even that. And in order to have tension, we need enough context and specificity (not vagueness) to get fully invested in what's happening. We can't feel the same level of tension if we aren't as deeply invested. Crimes of Grindelwald doesn't have a clear surface story. Instead, every character is chasing after the undercurrent, which we can't fully appreciate because it's underneath what the audience sees. Let's look at the first film for contrast. 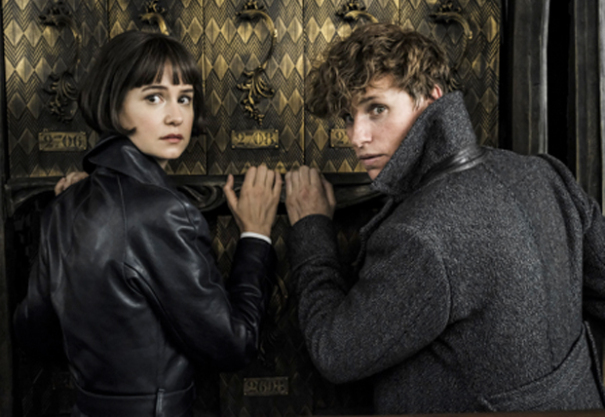 What is the undercurrent of the first Fantastic Beasts film? 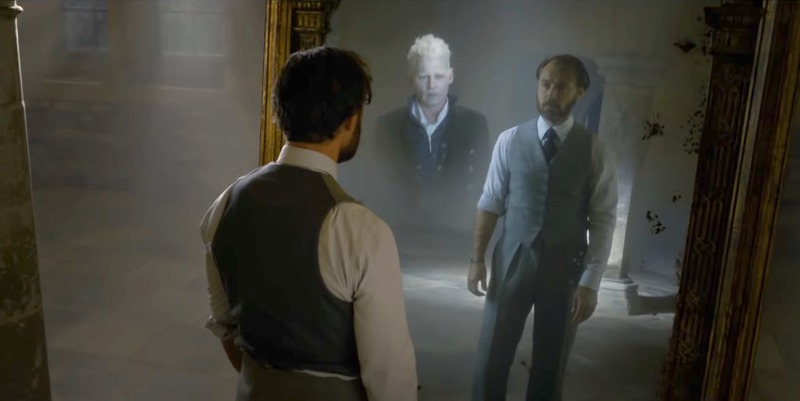 It's that Grindelwald is trying to locate an Obscurus to use to further his political agenda. What is the surface story? It's that Newt has a Thunderbird he wants to release and is studying and traveling to write a book about fantastic creatures, but more than that, it's that he has to catch all his creatures that got loose. He has a tangible (surface) goal that is easy to understand and follow. Because of that, we can experience tension, and progress on the surface story while simultaneously trying to piece together the undercurrent. But in Crimes of Grindelwald, the surface story isn't there. Sure, Newt wants to be with Tina, but that's not very tangible--it's abstract--nor does it actually take up much of the plot. He's sort of helping Dumbledore, but it's not very concrete (not to mention he's on the fence about it). And everything that relates to the story progressing comes back to people looking for Credence--which is supposed to be the undercurrent. Because no one the audience is close to really knows who Credence is, we just know that he might be someone important, and because no one in the audience really has a clear tangible understanding of what the ramifications or consequences would be if he is said person, we don't get that strong tension of rising action or that payoff of a climatic end. Because it's an undercurrent, we don't know enough about what is going on. Sure, who he is and what that could mean is touched on several times. But the audience doesn't get to really consider or feel the consequences of said meaning. We don't really get to feel the stakes. In the end, in some ways, no one really wins and no one really loses, and we just get more information. I've heard this is one reason why people didn't like Order of the Phoenix, no one really wins, no one really loses, and we just get more information (though that book is actually my favorite in the series) BUT it's okay because we win the surface story--Harry and Hermione defeat Umbridge and at the end of the overall story, Hogwarts is restored to its glory with Dumbledore as the headmaster. All the members of the D.A. got to help fight off Voldemort's followers--and Harry gains more friends and supporters, which was on of his struggles through the volume. In fact, the undercurrent in Order of the Phoenix is actually very similar to what's supposed to be the undercurrent in Crimes of Grindelwald--not because of the content itself, but because of the story pieces and structure. In Order of the Phoenix, we know Voldemort wants something, but we really have no other idea as to what that thing is for most of the story, other than it could be a weapon he didn't have last time (and what also helps is that at one point in the book Harry comes to the wrong conclusion that he is the weapon). 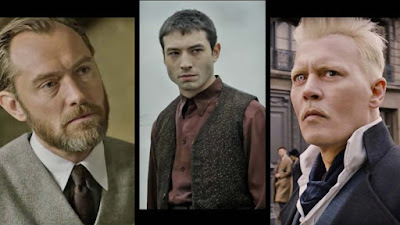 Similarly, we don't really know what Credence is, other than he could be someone dangerous that Grindelwald could use. We don't get the information until the last scene. All of the important characters are chasing the same overall goal, and we don't really know what it is until the last scene. Which is where some people freak out. Did Rowling change canon? Did she? Didn't she? So naturally I came home and hopped online to see what I could find. From what I can tell, my interpretation is right, and to me, that means the canon wasn't really changed, only added to. I actually think the reveal is even plausible, when you consider the characters that were involved. However, even my interpretation pleads for more information--which I'm assuming I will get in the next installment. I can easily see how this reveal could upset some fans and people. Personally, I'm okay with it (remember how I told you I was waiting for the ridiculous reveal where Grindelwald and Dumbledore somehow magicked a human child into existence? *facepalm* That's the kind of crazy I was trying to prepare myself for. ), I just want to know the other information, because part of even the most sensible interpretation is missing a piece. It's easy to pull this story apart and talk about where it's weaker, but until you have actually tried to write a story at a professional level, let me tell you, you have no idea how difficult the process is. After all, we only see the finished result--not all the idea fragments and plot threads and concepts that were scrapped or changed or whatever. Some days I'm more than grateful I'm not J.K. Rowling and having to deal with the pressures of nailing the Wizarding World every time for a MASSIVE worldwide audience. I mean, she's amazing, but she's still human. I also think that sometimes fans forget that the creator doesn't actually owe us anything. Bless you, amazing, wonderful J.K. Rowling. Originally Fantastic Beasts was meant to be a trilogy, but then it grew into five movies. Maybe like The Hobbit, it really should have stuck with what was intended for it--that might have helped with the feel of the movie. 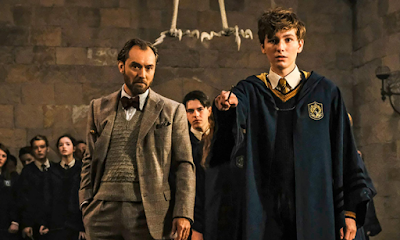 However my (unimportant) opinion is that more than that, the audience needed a stronger surface story--like every other Wizarding World installment has. Even if it was repurposing something already there, like that plot thread about Grindelwald's vial so that it was surface content instead of just more undercurrent tagged on. That could bring some real great tension into the story--knowing what it was, what it meant, and having Newt try to get it--but again, like Credence, we didn't understand what it was until the very end. That's probably what I would have suggested the writer do. So did I like the film? Looking at how long it took me to talk about the plot, you might think I didn't. But one thing as an editor that I've learned is that it almost always takes longer to talk about what doesn't work than what does, because you actually have to explain how those pieces function. I loved it. Already looking forward to seeing it again. However, I think this film is probably more for the die hards (largely because it lacks a surface story), where you can soak in all the characters, magic, Easter eggs, and connections that Rowling is so great at--with mentions of Lestranges and Mclaggens and Dumbledores and Traverses--and bask in the world you call home. P.S. Did you notice how well they interlocked Dumbledore's and Leta's characterizations?! I want to go on and talk about it in more depth but don't want to say too much--but notice how they are similar and how that was handled? Five points to the filmmakers on that micro-concept. Stathis, awesome! Glad you liked this one better. And I agree that with how this one is structured, it's hard to judge until we see the others (though some would consider that a film flaw within itself). And yes, I've been having lots of fun getting back into the theories with people! I love this!! Thank you for your honest, non-spoiler review :) I went to see the move a few days ago, and my thought was that it was a lot better than I've been generally hearing. Mostly, I was just confused. There was a lot going on, and I'd love to see it again to try to put it all together! And that reveal... O_O I have a theory about it, but I won't spoil anything for anyone else. ;D I don't think it changed canon at all! Thank you! Yes, and I believe this is one reason why we felt confused during it. It was a lot to take in with little to hold onto. I saw it again last week, and I was able to follow it better.